What follows is a list of items that La Belle Compagnie suggests that you might have as personal possessions. Bodkin. This could be a “sharp pointed dagger” but it might also be a needle-like implement useful for many things, perhaps something like what we modernly call a marlin spike. Coins. Silver and “black money” coins would be carried. You might want to keep them in a small bag within the larger purse. A selection of denominations and origins would be common for travelers. Some “cut” coins (small change) might be present, although some sources suggest that, in England anyway, minted farthings are common enough by the 1380s to have eliminated the need for slicing a penny into quarters. Combs. The combs of our period are double sided, with coarser teeth on one side and finer teeth on the other. Boxwood is a common material. Horn and presumably bone are acceptable materials. Ivory versions existed for nobles, usually carved or painted, or both. 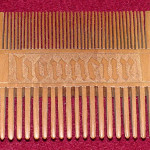 Ladies should add a mirror and case to their kit, possibly with a purpose-built leather case to contain the both mirror and comb. Grooming tool. An earscoop is a popular grooming item that has a small spoon like scoop at one end, intended for use in eliminating that annoying ear wax. Many also feature a dull blade, presumably for cleaning something else. Books often say the blade is for picking teeth, but it is just as likely that it was used for cleaning fingernails; maybe it was used for both purposes. Fire starting kit. This “item” is your basic iron strike-a-light, a chip or three of flint to start a fire, and some easily combustable material like tow. Some tow or perhaps charred cloth (which would need a container to keep it from getting pulverized) to start the tinder might also be carried. Keys. One for each of your locks (possibly even the ones at home) seems reasonable. Knife. 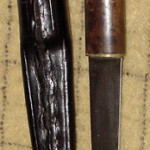 Most everyone should carry a small knife for use as a tableknife as well as general utility use. 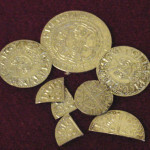 The London finds suggest that whittle tangs are the most common in the 14th century, although scale tangs come into use in the latter part and dominate knife cutlery in the 15th. Needles. 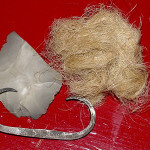 Sewing needles were most likely of copper alloy or iron. Steel needles existing by the late 14th century since King Richard II ordered thousands of them from Germany to adorn a court outfit. They can be carried in a needle case of leather, bone, or copper alloy. Pastimes. 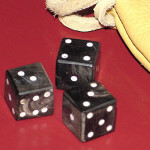 These would include entertainment stuff such as dice (medieval dice come in peyres of three), gaming equipment for chess, draughts, and, yes, even cards by the late 14th century (although we don’t know what they should look like until the later 15th century), and reading material for the literate. Points. 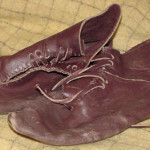 Points, or laces/cords, are useful for many purposes. One should have a number of them for repairs. They could be cut from leather or braided from strong cord. They were apparently sold by the dozen. The ends of points are usually protected by metal chapes called aiglettes. Beads. In our period, prayer beads (not yet commonly called rosaries but a “peyre of beads” instead, meaning a set of beads) have not yet settled down into a single pattern. 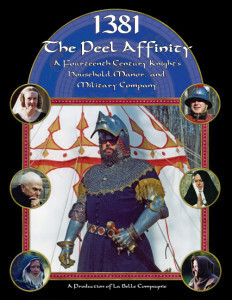 Straight, rather than circular, sets seem to be more common in the 14th century, gradually surrendering to the circular in the 15th. A string of 10 Ave beads with a Pater Noster bead on either end is a good basic set. 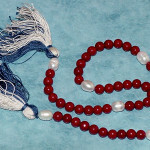 Pater Noster beads are usually larger and/or of a different material than the Ave beads. Materials vary widely. Those of the poor were often homemade of found materials. The highest ranks might have rosaries with beads of gemstone and golden fittings. In between come semi-precious stones, such as jet or amber, and carved wood, bone, or ivory. 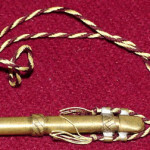 The cord is knotted at either end and tied into a tassel. Small devotional items or embroidered relic bags are occasionally attached to the string. Thimble. The most common is the “beehive” type, either cast or made of sheet. Some thimbles had leather liners, possibly for comfort or for a better fit. Presumably leather pads with a finger hole were used as well. Thread. A traveler would presumably only carry a small amount, enough for emergency repairs. Ladies would likely carry more and possibly an assortment for embroidery work. Thread can be wound into a ball or carried on a bobbin of wood, bone, or ivory that is turned for simple, banded decoration. Tweezers. Copper alloy tweezers, of flat sheet and blunt ended, show up in archaeological contexts and are usually classed as grooming implements. Whetstone. A fine-grained stone to sharpen one’s knives, etc. Many medieval ones have holes drilled in them, presumably so they may be suspended from a thong. 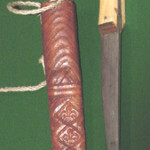 Reapers are occasionally seen in manuscripts with a whetstone in a leather sheath. Boget. This is a water bag or vessel of some sort. Costrels of leather or pottery seem suitable for all ranks. Bottles (of leather, of course) are in use. Poorer persons could use hollowed gourds. Corks are inappropriate. Stoppers should be made of wood (possibly waxed for a better fit) or leather (possibly over a wooden core or just a rolled piece). Jewelry. 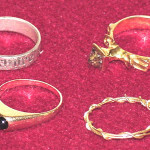 Rings and brooches are far and away the most common. In quality they range from cheap and nasty lead/tin knock-offs with dabs of paint to represent a stone for poor commoners to finely worked gold and enameled items often set with one or more precious stones for the very rich. Necklaces are atypical at best and ear-rings even more so (though there is some hint that exotics such as gypsies and Saracens wear them). Knife. Yes, again. Most commonly worn hanging from your belt in a sheath. Pilgrim badges. Such devotional signs/souvenirs were primarily made of pewter (some may have been of lead, such as was commonly used for ampoulla-style items) and made in mass quantities. 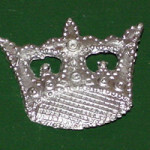 Higher quality badges for higher ranking folk were made in silver and gold, often as custom work. Some shrines, like that of St. James of Compostela, used found objects (scallop shells) as well as the manufactured badges. We do not encourage folks to go overboard inn these things, although we are not so strict as to require you to have actual visited the shrine represented by any badge you wear. A livery token. Out company members get pewter bells to wear as Sit Geoffrey’s token. Gentry members are encouraged to replace it with a version more suitable to their exalted station. Eating gear. A bowl of treen (wood) or rough pottery is excellent for lower classes. Pewter appears among middle income and continues on up. Only nobles or the very rich could be expected to have silver or gold items. Pottery is acceptable at any rank (given increasingly elaborate decoration and progressively finer execution). Possibly you might have a plate (same materials as for bowls) though it seems typical for two people to share a plate at table. Gentlefolk would have a wider variety of eating utensils and tableware such as masers, a selection of glasses and goblets, a carving set, a range of ewers for oil and vinegar, washing water, wine and so on. Devotional Objects. Religious objects are integral and intimate part of fourteenth century life and many would be worn or carried. The nature of the objects remains fairly constant over the social classes, but as usual the quality and quantity increase with higher rank. Typical objects include pilgrim badges, beads (rosaries), crucifixes, etc. Nobles and the rich could have reliquaries, portable shrines, devotional paintings and carvings (possibly set up as diptychs or triptychs), devotional books (such as psalters and books of hours). The very richest would have portable altars, vessels and vestments for Mass, and their own priests tasked with dealing with all of it. Drinking vessel. Bowls were considered a suitable drinking vessel. Those used by the rich folk were pretty fancy, made of rare woods and having silver rim, metal feet, decorated lids, and metal mounts, often enameled. A mug or cup of pottery or wood (turned or possibly stave-built) would seem to be the most common. 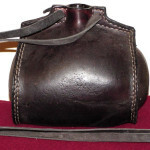 Horn is a possibility, as is leather, but the exact form of such vessels remains elusive. Richer folks may have metal, crystal, and glass as well as combination-material vessels. Horse and Horse Care Stuff: Horses were a big part of medieval life, especially for travelers. A male (mallet for driving the tether peg), hode (tether line? ), halter, saddlecloth, spurs, and a horse combe (a curry comb) would seem to comprise a basic equestrian kit. Knife. Didn’t we see this somewhere before? Why not have another one? After all, it’s 1382 and we’re all barbari– er, civilized. Lyngel. This item appears to be to a “first-aid kit” of linen thread and possibly small strips of linen to serve as bandages. Nightcap and kerchief. These are for wear in bed. Most likely these are your only bedclothes. Shoes. Good shoes are recommended. Many of our folk find pattens indispensable for inclement weather. Hunting gear. Spear, bows or crossbow, arrows or bolts, horn, leash, etc. For the Literate. Pen, paper , ink, parchment, reed, wax, pommes (round bag of pumice powder), books and a penknife. Most of these items would have molded and decorated leather carrying containers. A need for writing supplies would only apply to a person with pretensions to literacy and if carried, all of the equipment would be necessary. Paper is in common use, especially for transitory written items such as daily accounts and letters. Paper mills are operating in several places in Europe at this time (though apparently not yet in England). Travel papers. These could include letters of credit, travel permissions, safe conducts, letters of introduction or commission, letters from loved ones, or similar items being carried as a courtesy or by commission. A “container”. Containerization is a very medieval concept. Valuable items often had custom-made containers to keep them safe while traveling. 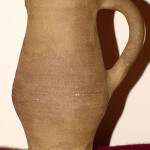 Glass vessels and fine metalwork would be carried in molded leather (possibly cuirbouilli) containers. Some of these had their own carry straps. Small, easily lost items (rings, other jewelry, coins) would be kept in pouches of leather or cloth or in small cofferets. The poor folks would likely transport their goods in soft containers, and the family’s chest probably never left the house. Personal goods can be kept in a scrip, a strapped bag of leather or heavy cloth (such as canvas). Large items and tools of the trade can go in a sack or three. Wicker baskets and backpacks are also known. 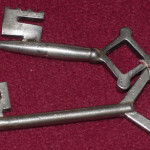 Whereas pilgrims were allowed a chest (and advised to have a strong lock), it is reasonable to expect that any traveler of at least moderate means would have one. If you’ve got a lot of stuff, you would have several. Chests are made of wood and come in several types including the typical flat-topped chest (easily stackable) and the round-topped coffer (whose top would help shed water).